Home » VectorVest » Sopheon #SPE has risen 8X since first being flagged up by VectorVest. We still rate the stock as a buy! Sopheon #SPE has risen 8X since first being flagged up by VectorVest. We still rate the stock as a buy! By Alan Green in VectorVest on 31st January 2018 . There is lots still to come in this excellent growth prospect. Woking-based Sopheon (SPE.L) is engaged in the provision of software and services in the product lifecycle management (PLM) market. The Company operates in two segments: N America and Europe. Its Accolade solution provides integrated support for innovation planning, roadmapping, idea and concept development, process, project, portfolio, resource and in-market management. Its offerings include alignment of long-term innovation plans with market requirements, industry regulations, and supply chain capabilities; generation and development of ideas and concepts to fill gaps relevant to achieving strategic initiatives; process and project management that tracks and enables decision making, focused on evaluating projects associated with innovation initiatives, and data management, analytics and integrity tools. Subsidiaries include Sopheon Corporation, Alignent Software, Inc., Sopheon NV, Sopheon UK Ltd and Sopheon GmbH. On Monday 29th Jan 2018, SPE updated on trading for the year ended 31 Dec 2017. The strong trading in the closing weeks of the year resulted in two substantial Accolade deals signed, one in the USA and one in Germany, each with a multinational enterprise that is an undisputed leader in its field. Consequently, the board expects that reported revenues for the year will be over $28m, up from $23m in 2016, and comfortably ahead of current market expectations. EBITDA and PTP will also be significantly ahead of current market expectations, with a year-end net cash position expected at $9.5m (2016: $4.2m). Looking forward overall revenue visibility for 2018 already stands at $18m, vs. $13m at this time last year. FY results will be announced on March 22nd 2018. VectorVest first identified SPE as a quality investment opportunity as far back as 2016 when the stock traded at around 70p. 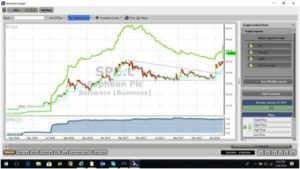 A spectacular 8-fold return since then sees SPE trading at 560p today, but despite this the VectorVest stock analysis and portfolio management system indicates that there is considerably more upside to come. Among a range of metrics highlighting value, the Earnings Growth Rate (GRT), (which reflects a company’s one to three year forecasted earnings growth rate in percent per year) sees SPE score 17%, which VectorVest considers to be very good. The VST-Vector metric (VST) and the master indicator for ranking every stock in the VectorVest database, logs a rating of 1.28, again very good on a scale of 0.00 to 2.00. Finally, despite the meteoric rise in the stock price, the VectorVest Value metric attributes a current value of 646p per share to SPE, meaning the company is still undervalued at the current 560p. The chart of SPE.L is shown above over the last two years of trading. The green line study above the price reflects the VectorVest valuation while the blue line study shows the growth of Earnings per share (EPS) over the period. The share is on a Buy recomedendation on VectorVest after recently gapping through a 52 week high. This is regarded by technical analysts as a bullish sign. Also of interest to technical analysts is the “pennant” chart pattern from which the share broke on the 4th January 2018. The target from this breakout by conventional charting techniques is approximately 700p. Can Sopheon keep going up? Some investors may be put off by investing into SPE at such heady levels given the 8-fold increase in value. But the cash generative nature of this well-managed software business is precisely why it’s stock has historically delivered such strong returns for shareholders to date, and those same qualities exist in abundance at SPE today. VectorVest believes an ‘if it isn’t broke, why try to fix it’ approach is warranted for SPE, with every reason to keep buying the stock for continuing growth. Readers can examine trading opportunities on SPE and a host of other similar stocks for a single payment of £5.95. This gives access to the VectorVest Risk Free 30-day trial, where members enjoy unlimited access to VectorVest UK & U.S., plus VectorVest University for on-demand strategies and training. Link here to view.